Optimus Prime: Everything humans know of our planet we were told had been shared. You lied to us. Throughout time, as far as Autobots are concerned, it has always been important to fight for what is right. 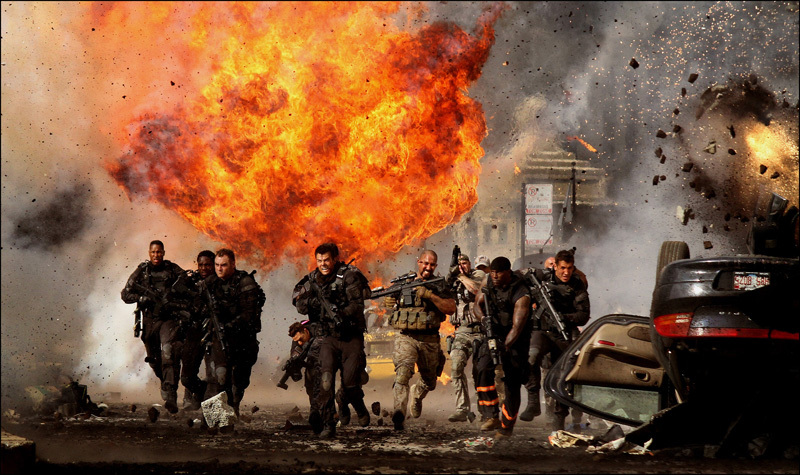 I think Michael Bay believes in what is right, I really do. His more is more approach has proven to be poison from a critical standpoint, but I truly believe that he enjoys being able to deliver satisfying action and mayhem to audiences around the globe. These Transformers films have certainly given him the opportunity to do things that have not been done before and it stands to reason that the fun element has been embraced by many. This latest entry is pure spectacle through and through. It delivers (especially in the final hour) a ridiculous amount of momentous special effects, all very shiny and presented in glorious 3D. The same flaws that effected the previous Transformer films are still present here, but I can say this: Transformers is still the best live-action, alien robot, sci-fi adventure, toy adaptation franchise there is. In the previous two films, we learned that the Hoover Dam was a cover up for a sacred alien artifact that found its way to earth and that the pyramids in Egypt actually contained a weapon that could destroy the sun. This third film now informs us that the moon holds another Transformer-related secret. 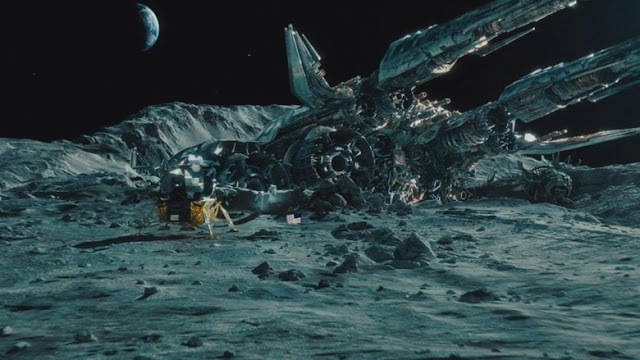 A Cybertronian ship known as, “The Ark,” crash landed on the moon during the 1960s, and contains technology that could actually save the Transformers’ home world. Simply knowing that a foreign object crash-landed on the moon, this was actually the real reason behind the U.S. Space Race. Cut to present time, we find world savior (two times over) Sam Witwicky (Shia LaBeouf) now living with a new girlfriend, Carly (Rosie Huntington-Whiteley), and trying hard to find a job, having now graduated from college. He has frustration over not receiving more responsibility due to his accomplishments, but must deal with it anyway. All of Sam’s robot pals, the Autobots, continue to work in secret, finding evil Decepticons around the globe to destroy. 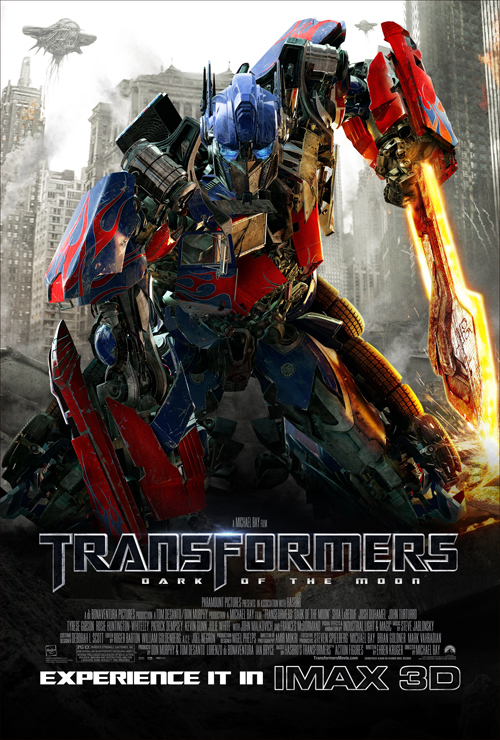 Leading the Autobots is Optimus Prime (voiced by Peter Cullen), who manages to come across a piece of The Ark during a mission. Now aware of its existence, an Autobot team manages to find the lost Ark on the dark side of the moon, which has held a Transformer known as Sentinel Prime (voiced by Leonard Nimoy) in hibernation. 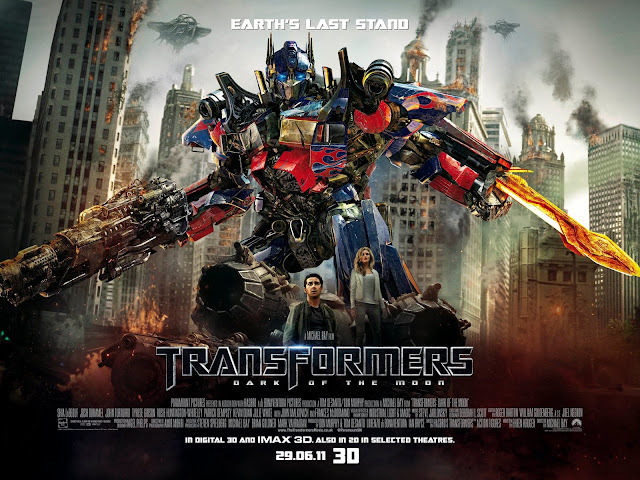 The human forces in charge of the Transformers, including Secretary of Defense Charlotte Mearing (Frances McDormand), learn more about what was on The Ark and soon find that they are facing invasion and total takeover by Decepticons, with far worse plans in mind for earth’s future. It will be up to Sam, Special Team leaders Lennox (Josh Duhamel) and Epps (Tyrese Gibson), former Agent Simmons (John Turturro) among other humans, and the few remaining Autobots to stop them. It should also be noted that there is more than meets the eye for some humans, who have made diabolical deals of their own. Simmons: Years from now, they are gonna ask us: where were you when they took over the planet? 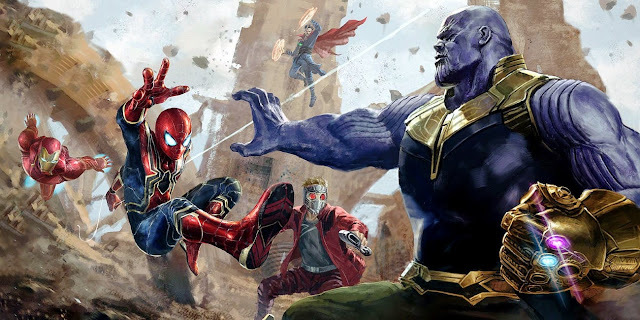 There seems to be a lot of urge from those who do not point their nose up in the air at these movies and simply want to go and have fun to say that you should accept this movie for what it is and revel in the awesome showcasing of its action and special effects. I would love to praise this movie for just that reason and for the most part I did have a lot of fun watching it (this is a positive review, overall); however, the fact is that in matching up this movie to others like it, it’s not so much great as it is loaded with so many different ideas, action, effects, and other crazy sequences that it seems to just hope that you find something that sticks well enough to appreciate the film as a whole. I will speak of what this film does manage to do right, but there is still a lot of stuff that the film gets wrong or tries too hard at. This film’s story is inconsequential, yet there is nearly two hours of setup that lead to the final, non-stop action set pieces. Still, it was not enough to have us simply arrive at an alien invasion, with humans and Autobots fighting back, we needed to move along through all of the government secrecy stuff, mixed with Sam’s plight to make a name for himself in the real world. While the recent (and equally silly) Battle: Los Angeles managed to simply throw everyone straight into a warzone against aliens, Transformers spends so much time trying to construct a story that we are supposed to be invested in, but honestly, I did not really care. Every time we came back to dealing with human drama I just did not care. This would most likely be due to how little was scripted to have us invested in these characters. LaBeouf’s role as Sam has always served as the human anchor for this series, but this time around I really became burnt out on his character. I can appreciate some of what he brang when dealing with certain intense situations, but he bordered on irritating a lot this time around. In addition, having ties to other characters, simply because they have been a part of the franchise is nice as well, but there really wasn’t much to any of these people. Among the new additions to the cast, I am not sure what McDormand and John Malcovich were doing here, but they at least seemed to be having fun. As far as Megan Fox’s replacement goes, I actually did not find her to be irritating in any real way, as far as acting in her first movie goes. Michael Bay manages to frame Whiteley in some pretty hilarious ways, including having her stare in front of explosions, in slow motion, but she worked well in the role of an interchangeable, female love interest. I think the most noticeable flaw, which has been present in every film, is how hard it tries to be funny, while reaching in many other directions as well. This is a movie adapted from a toy franchise and has every right to be humorous, but man does Transformers try hard to make you laugh. Having zany characters like Turturro, Malcovich, not to mention Alan Tudyk and Ken Jeong do wacky things along with Autobots who have accents aplenty, continues to burden this film with a lot of awkward rhythms. 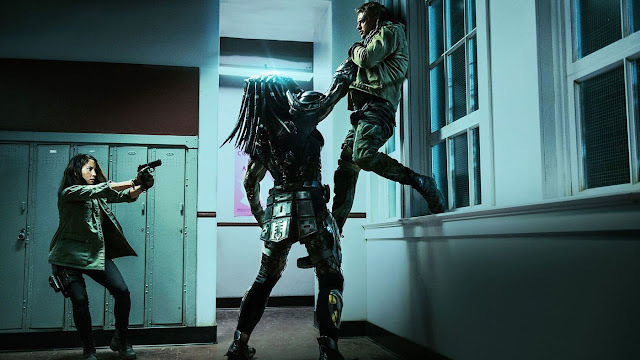 On top of that, the tone always seems like it is shifting back and forth between war film, alien film, over-the-top Bay film, all-age adventure, and then raunchy comedy. It does seem like writer Ehren Kruger and Bay’s tendencies once again outweighed Spielberg’s role as a producer. Optimus Prime: Today we take the battle to them! Now, as far as the positive aspects go, I did say early on that this film is pure spectacle, which definitely does compliment what this film has to offer. While some action is interspersed during the bloated first two acts, this film does have a spectacular final 45 minutes, which is non-stop intensity, as we watch giant freaking robots battle each other, with a small human contingent involved as well. Everything about this aspect of the film (y’know, the reason people have come to see it) has been incredibly well realized and is glorious to behold. The chief reasons the action works well and better than most other Michael Bay action films is due to the fact that special effects are amazing, there is some well handled choreography, and finally, because of the 3D. I will now address these three aspects, as the film would not have me recommend it without them. 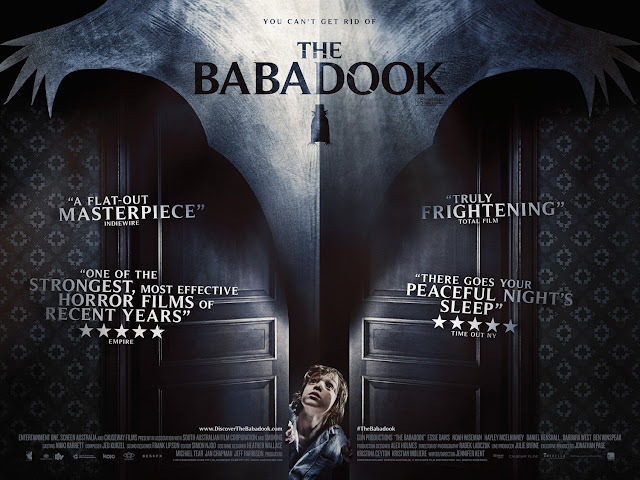 Starting with the 3D, I do not believe this film is better because I was able to witness it in three dimensions; however, I do think that shooting in this format has essentially put a shock collar around Bay as a director. 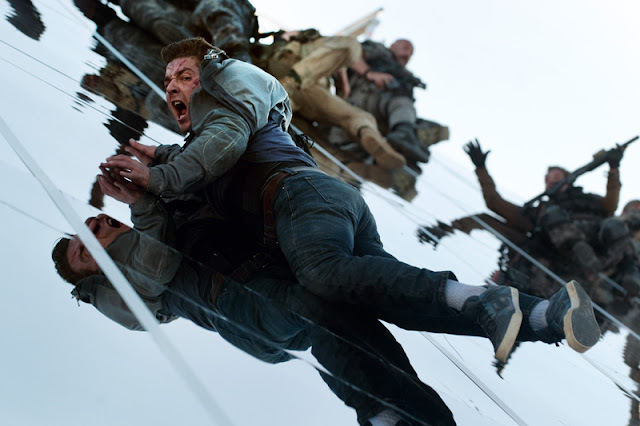 Because Michael Bay has a tendency to cut at a rapid pace, which has led to dizzying complexity when it comes to watching his action scenes, using 3D cameras was a great way to rein him in. Because those cameras are heavy and complex, audiences now get a chance to see wonderfully long shots of action, as we sweep through various set pieces. This enables audiences to have a chance to be astonished by the level of detail found in this film’s fantastic special effects. Fortunately, along with proving to be comprehensible, this is also the best live-action 3D experience since Avatar. Each scene has great depth, colors are bright and vivid, and the film has a lot of fun using this format to its advantage, without going over-the-top and throwing things at you. The special effects in this film do their job of selling me on the fact that robots exist. Having previously revisited the first two films, I can say that the first did a great job of grounding these robots in some kind of reality; giving them weight and having them effect the world they were a part of. The second film drops the ball on this aspect quite a bit. Dark of the Moon brings back that sense of weight that Transformers should be carrying. Seeing the robots physically have an impact on buildings, the ground, the characters, etc. 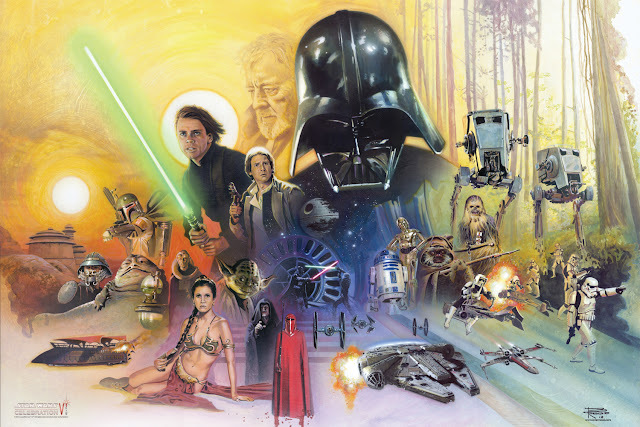 all goes a long way to keep me invested in the film’s basic premise. It also doesn’t hurt that this film provides a massive sense of scale to the destruction of Chicago, which literally has robots knocking over skyscrapers. Finally, the action sequences themselves are all well handled. There are some key sequences; two that comes to mind are ones that feature soldiers jumping out of planes, wearing glider suits that have them actually flying between (and through) Chicago skyscrapers. Knowing that there actually were base jumpers with 3D cameras strapped to their heads doing this just makes it better. Then you have fight scenes that involve Optimus Prime tearing through Decepticons in downtown Chicago. It is a credit to everyone involved that I could legitimately care for how well this talking truck could do during that time. I still think there is a weakness that surrounds the fact that these scenes are only incredibly well done on an individual level, but not in a way that seems create a sensible arc for these action sequences. You could mix around some of these action beats and still have the characters reach the same conclusion. Regardless, as far as massive, special effects-filled battle sequence go, it will be hard to top the impressively large scale that Transformers has provided. This movie is preposterous. That is not due to the premise that you are supposed to accept or in regards things that you would not expect in these types of movies anyway. 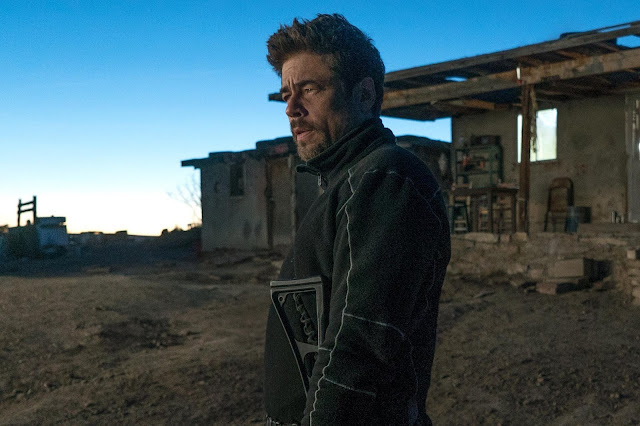 It is preposterous due to its bloated running time and strange filmmaking sensibilities that imbue the film with awkward storytelling and humor, while balancing it with a large amount of dark tragedy, as robots attempt to take over the world. Still, the film does find a handle on delivering all the spectacle one would want in the be-all end-all of giant freaking robot movies. While the first Transformers film still seems to be the only one that had a soul of some kind at its center, Dark of the Moon does manage to bring an epic amount of imagination to life and provide an acceptable amount of very expensive fun to the proceedings. Roll out. Optimus Prime: You may lose faith in us, but never in yourselves.